WASHINGTON (CNN) - A spokesman for Texas Republican Sen. John Cornyn confirms he objected to a voice vote approval of Hillary Clinton's secretary of state nomination today. His office released a letter Friday he sent to the New York senator expressing concern that foreign donors to former President Bill Clinton's foundation might give the appearance of a conflict of interest. “I remain deeply troubled that America’s foreign policy and your diplomatic mission will be encumbered by the sweeping global activities of the Clinton Foundation … unless tighter foreign fundraising restrictions and transparency protocols are adopted by your husband’s organization,” Cornyn wrote in the letter. How about Bush – 41's Billions from Saudis for doing nothing but, smiling over at Carlyle Group? How about all the hundreds of millions James Baker got for his law firm? Wasn't Jim Baker Secy of state and his law firm go oodles of $ and contracts before and after his tenure. I don't remember any Repubs complaining about it. Get over it JC. Enough with partisanship – do something for the country. It's been acknowledged by most that the scrutiny that has already been agreed to by Bill C. is unprecedented in comparison to any other previous presidents or candidates for office. They're already disclosing more than anyone ever has and enough to dispel any conceiveable conflict of interest. 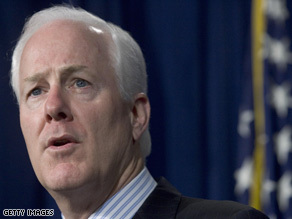 But of course, nothing would be enough to satisfy Cornyn. And to the comments that "foreign state contribution to [BILL] Clinton's foundation will be a conflict of interest"-- it's HILLARY CLINTON that is being confirmed as Secretary of State, not Bill. Bill will not be making decisions. Give Hillary credit for more than that, she's not stupid.